Arthur Tatum Jr. (October 13, 1909 – November 5, 1956) was an outstanding African-American jazz pianist. Art Tatum is known to the world of jazz piano as the supreme master of the keyboard, the pianist whose virtuosity baffled classical and jazz musicians alike. Nearly blind and mostly self-taught, Tatum played with the speed of light, adding complex chordal combinations to a swing that was exceptionally powerful, even without the support of a rhythm section. His style was grounded in the stride school of piano jazz, but wasn’t in any way bound by it. Tatum is still idolized by other jazz pianists, many of whom have vainly attempted to emulate his brilliant style over the years. Tatum was born in Toledo, Ohio. From birth he suffered from cataracts which left him blind in one eye, and with only very limited vision in the other. He played piano from his youth (after switching from the violin) and received some formal training before developing his amazing technique on his own. A remarkable prodigy, Tatum learned to play by copying piano roll recordings his mother owned, playing by ear by the age of three. Tatum would learn both parts of a piece for four hands by feeling the keys depressed on the piano. By the age of six he was able to play songs originally performed as duets, unaware that there were supposed to be two players. In this way, he developed an incredibly fast playing style, without losing any of his accuracy. As a child Tatum was also very sensitive to the piano's intonation, and insisted it be tuned often. Tatum played professionally in Ohio and especially the Cleveland area before moving to New York City with Adelaide Hall in 1932. There, he made his first recording, “Tea for Two,” a tune that would stay with him for the rest of his life. Tatum soon returned to the Midwest where he worked until his much anticipated return to New York in 1937. Later, he would also tour England and regularly appear on the West Coast. Tatum recorded commercially from 1932 until near his death, though the predominately solo nature of his skills meant that recording opportunities were somewhat intermittent. Tatum recorded for Decca (1934-41), Capitol (1949, 1952) and for the labels associated with Norman Granz (1953-56). Tatum tended to record unaccompanied, partly because relatively few musicians could keep up with his lightning-fast tempos and advanced harmonic vocabulary. He formed a trio during the early 1940s with “singing” bassist Slam Stewart and guitarist Tiny Grimes and later Everett Barksdale. During their short period of time together, they recorded a number of 78 rpm discs that feature exceptional interplay among the musicians. For Granz, he recorded an extended series of solo albums and group recordings with, among others, Ben Webster, Buddy DeFranco, Benny Carter and Lionel Hampton. Tatum also briefly appears in the 1947 film The Fabulous Dorseys. Art Tatum died in Los Angeles, California from the complications of uraemia (as a result of kidney failure), having indulged in excessive beer drinking since his teenage years. He is interred in the Forest Lawn Memorial Park in Glendale, California. Tatum drew inspiration from his older contemporaries, James P. Johnson and Fats Waller, who were the embodiment of stride piano. From the foundation of stride, Tatum made a quantum leap in terms of technique and theory. Tatum's extensive use of the pentatonic scale, for example, may have inspired later pianists to further mine its possibilities as a device for soloing. Tatum would have a great influence on later jazz pianists, such as Bud Powell, Thelonious Monk, Lennie Tristano, Chick Corea, and especially Oscar Peterson. Transcriptions of Tatum are popular and are often practiced assiduously. But because his playing was so difficult to copy, only a handful of musicians—such as Oscar Peterson and Johnny Guarnieri—have attempted to seriously emulate or challenge Tatum. The list also includes Herbie Nichols and Phineas Newborn, whose recording of “Willow Weep For Me” is closely modeled on Tatum. Tatum also exerted some influence on players of other instruments. 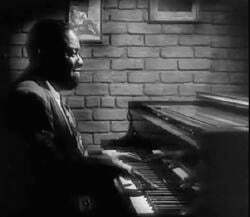 Tenor great Coleman Hawkins was impressed by the fast lines of Tatum’s piano playing and reportedly used it as an incentive to further develop his own virtuosity. Alto saxophone player Charlie Parker, the initiator of bebop, was also influenced by Tatum. When newly arrived in New York, Parker briefly worked as a dishwasher in a Manhattan restaurant where Tatum happened to be performing, and often listened to the legendary pianist. Art Tatum is not only the epitome of the jazz pianist in terms of technical excellence and sophistication, he is also one of jazz’s most enigmatic figures. In large part, this is due to the fact that, legally blind and with hardly any formal training, he could consistently play at a level that appeared almost superhuman. Many also consider him a creative genius capable of producing unheard of melodic, rhythmic, and, above all, harmonic patterns, but some have suggested that his brilliant technique covered up a lack of creative imagination, at least when compared to the greatest figures in jazz. Somehow, Tatum’s music could also be compared to a black diamond, as it was usually not surrounded by a particularly joyful atmosphere. Paradoxically, the feeling created by Tatum’s playing was more meditative and reserved, in spite of the considerable energy he produced. Tatum did not have the spontaneous melodic innocence of Fats Waller or the poetic purity of Jelly Roll Morton. Neither did he have the subtle, volatile rhythmic sense of Earl Hines (on this point, it is interesting to compare Tatum’s 1940 rendering of “Humoresque” with that of Earl Hines around the same time). This merely proves that no single musician can possess all qualities. Tatum’s greatness lied elsewhere. Tatum introduced a strong, swinging pulse to jazz piano, as well as other new sounds in his improvisation and self-accompaniment. Tatum rarely abandoned the original melodic lines of the songs he played, preferring instead to feature innovative reharmonizations (changing the chord progressions supporting the melodies). Occasionally, Tatum's reharmonizing was simply a matter of altering the root movements of a tune so as to more effectively apply already commonly used chords from early jazz and classical music. Yet many of Tatum's harmonic concepts and larger chord voicings were well ahead of their time in the 1930s, and would be emulated by Bebop era musicians ten to twenty years later. Besides his right hand’s flurries of notes, Tatum’s trademark was a succession of chords, often one on each beat, that were so complex as to puzzle anyone trying to replicate them. Far from bringing a heavy or static element into his playing, these smashing chords would, by their very original sound, further enhance the swinging power of his playing. Tatum worked some of the upper extensions of chords into his lines, a practice that was further developed by Bud Powell and Charlie Parker, which in turn was an influence on the development of modern jazz. Tatum also had a penchant for filling spaces within melodies with trademark runs and embellishments which some critics considered gratuitous, while his fans regarded the pyrotechnics as exciting and vital to his music. Tatum's solo piano recordings are his greatest legacy. He was not a composer and his repertoire was drawn mainly from the American standards songbook. He used his effortless technical brilliance, prodigious memory, and overall musical genius to create a library of piano masterpieces. Since Tatum was a perfectionist, he was never satisfied with the level of his playing and kept developing his technique until the end. His style would also grow in complexity. When compared with Tatum’s solos from the 1930s, the later solos are filled with more intricate lines, intentional false starts, and other developments that would go beyond the swing style—even Tatum’s own very special version of it. The speed and overwhelming nature of Tatum’s technique made his playing somewhat difficult for ensembles. Nevertheless, when he was playing with congenial musicians, these very same characteristics could become an asset. The recordings Tatum made with his trio testify to that. In these pieces, his powerful drive was enhanced by the two supporting players and the result was at times even more stunning than the solos. Art Tatum also appears in a number of recordings playing alongside other great jazz masters to maximum effect. His participation in the 1944 Esquire All American Jazz Concert at the Metropolitan Opera House shows him in superlative form, joyfully interacting with his peers. In spite of the few reservations indicated above, there is no doubt that Tatum ranks at the very top of his art. Tatum achieved real fame, but he essentially remained a “musician’s musician,” i.e., not one who would attract large crowds as, for instance, Louis Armstrong did. He was, however, idolized by fellow pianists. When Tatum walked into a club where Fats Waller was playing, Waller stepped away from the piano bench to make way for Tatum, announcing, "I only play the piano, but tonight God is in the house." Russian composer Sergei Rachmaninoff, after hearing Tatum play, claimed he was the greatest piano player in any style. Other luminaries of the day such as Vladimir Horowitz, Artur Rubinstein, and George Gershwin marveled at Tatum's genius. French poet Jean Cocteau dubbed Tatum "a crazed Chopin." Some jazz musicians liked to call him the eighth wonder of the world. Tatum's meteoric rise to the top began with his appearance at a “cutting contest” in 1932, that included Waller and others. Standard contest pieces included Johnson's "Harlem Strut" and "Carolina Shout," and Fats Waller's "Handful of Keys." Tatum was victorious, presenting his arrangement of "Tiger Rag." This was considered by Harlem musicians to be Tatum's ultimate contribution to stride piano, and taken as the most astonishing and original that would probably ever appear, in many respects, despite being an arrangement. In subsequent gatherings Tatum tended to prefer not to be followed by another pianist. He was not challenged further until Donald Lambert initiated a half-serious rivalry with him. Although Tatum refrained from classifying himself as a classical pianist, he adapted several classical works into new arrangements that showcased his own musical style, such as Antonín Dvorák's “Humoresque” and works by Jules Massenet. Only a small amount of film showing Art Tatum playing have been preserved (several minutes of professionally shot archival footage can, for example, be found in the video documentary Martin Scorsese Presents the Blues). Tatum appeared on Steve Allen's Tonight Show in the early 1950s, and on other television shows from this era. Unfortunately, all of the kinescopes of the Allen shows were discarded, though the soundtracks remain. Tatum posthumously received the Grammy Lifetime Achievement Award in 1989. A few years ago, an MIT student invented a term that is now in common usage in the field of computational musicology: The Tatum. It means "the smallest perceptual time unit in music." ↑ Jehan, Tristan. Creating Music by Listening, CHAPTER 3 Music Listening. Ph.D. Dissertation at MASSACHUSETTS INSTITUTE OF TECHNOLOGY, 2005. Retrieved June 23, 2007. Howard, Joseph A. The Improvisational Techniques of Art Tatum. Case Western Reserve University, 1980. Jazz Profiles from NPR: Art Tatum. Jazzed in Cleveland - Part One. This page was last modified on 15 April 2016, at 16:02.